Relationship building with Indigenous communities wasn’t always given the necessary time or resources - it was not a priority. Ms. Robertson, in her former role as Communications Manager for the City, managed Indigenous relations off the corner of her desk. Projects between the City and the Tk’emlúps te Secwépemc community languished on the books for years with little movement. While she wanted to devote time and energy to working with Tk’emlúps te Secwépemc, she simply did not have the time or resources. 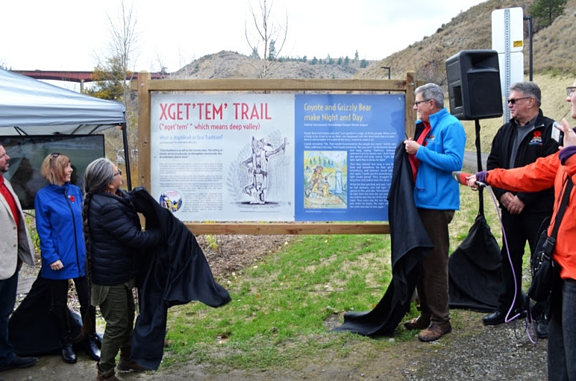 In early November 2018, a newly constructed 1.7-kilometre multi-use pathway was named Xget'tem' Trail in recognition of Tk’emlúps te Secwépemc’s traditional place name for the area. Signage at trail entrances provide details about the importance of oral tradition and knowledge keepers. Xget'tem', which means the deep valley, was chosen through collaboration between the City and the Tk’emlúps te Secwépemc. Two other collaborative initiatives include a public signing of a Letter of Understanding (LOU) between the City and Tk’emlúps te Secwépemc in February 2019 on the Negotiation and Formalization of Cultural Heritage Protocol Agreement. This LOU serves as a commitment to preserving and promoting Secwépemc values, including the protection of Tk’emlúps te Secwépemc cultural heritage resources. Later this year, the City and Tk’emlúps te Secwépemc will hold a public signing of another LOU on the Stuart Wood Property - Cultural Centre. The LOU is a commitment to work together to establish a cultural centre at the Stuart Wood property that is vibrant and inclusive in the sharing of the history of Kamloops and surrounding area, the First Peoples of those lands, Truth & Reconciliation, language, and culture. “The City has been inviting Tk’emlúps Council and staff to give presentations at our meetings, which really contributes to our ongoing education. And the Tk’emlúps te Secwépemc Chief and I will share our experiences at the Local Government Management Association conference in June,” says Ms. Robertson. Ms. Robertson’s goal of working to make the City of Kamloops a national leader in Indigenous/local government relations is certainly looking good! City staff should take Indigenous awareness training. And look for ways to keep the learning ongoing. You need to show that you are coming from a place where you want to learn. You need to be open and vulnerable in your approaches to your Indigenous neighbors. You are going to make mistakes and you are going to have to keep the relationship strong as you work through to a solution. When you do make a mistake, own it, and apologize in person as soon as possible. Be true to your word. While I like to think everyone operates this way all the time, I believe it is especially important when working with Indigenous communities due to their long history with those who haven't. If your organization’s relationship with Indigenous communities has not been positive, acknowledge it as such, even if you were not part of the organization when the relationship was formed. It is expensive to do things the wrong way; taxpayers don’t want to carry the burden of a government’s mistakes in Indigenous relations. Though you may have concerns about entering into discussions with your Indigenous neighbors for fear of using the wrong terminology or because these discussions may result in more engagement and increased timelines or costs, you need to do it. These discussions are not going away. They are only going to grow in importance due to requirements of other levels of government and Supreme Court of Canada decisions. And, more importantly, it’s the right thing to do. Here's a Pledge of Reconciliation organizations and corporations can adopt to guide their reconcilation actions. Click the image to grab your Pledge.